The Lucy’s Project conference aims to unite these professionals and organisations to raise awareness of the link between family violence and animal welfare, and to streamline responses. Veterinarians treating an animal with non-accidental injuries can be the first to observe pets and people at risk of domestic violence, and families seeking to leave domestic violence situations may need emergency veterinary care or temporary accommodation for their companion animals, which can range from small pets to horses and farm animals. Lucy's Project is the peak organisation raising awareness of the link between animal abuse and domestic violence in Australia. Next month it will bring together family violence specialists, veterinary professionals and policy makers for the Lucy's Project Conference Domestic Violence and Animal Abuse – Strategic and Practical Perspectives, hosted by the University of Melbourne’s School of Social Work and the Melbourne Veterinary School on 22-23 September 2018. The conference aims to unite these professionals and organisations to raise awareness of the link between family violence and animal welfare, and to streamline responses. Lucy’s Project founder Anna Ludvik said research in Victoria found 53 per cent of women who had experienced domestic violence had reported that a violent partner had hurt or killed one of their pets. Even without threats or abuse, many people experience threats to their pets as a means of control. “Companion animals are also often cited as the reason a victim returns to an abusive home or delay fleeing a violent situation,” Ms Ludvik said. She said many people were unaware of emergency pet accommodation and veterinary services for victims’ animals. 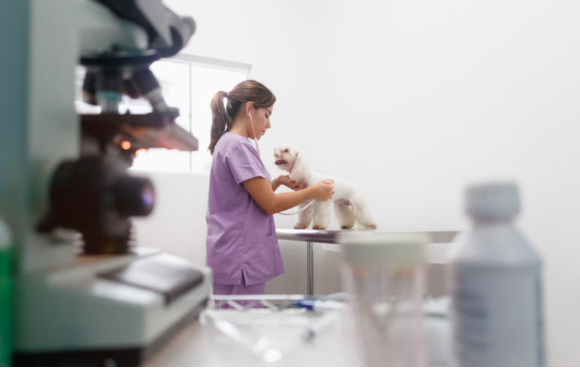 “Vets have taken a leadership role in helping to identify and raise awareness of this issue, but many vets do not feel they have the training or knowledge to link animal owners to services," Ms Ludvik said. Melbourne Veterinary School Senior Lecturer in Emergency and Critical Care Elise Boller is one of the conference organisers. Dr Boller said the conference would enable veterinary professionals to recognise the signs of non-accidental injury in pets, to handle verification of ownership and confidentiality, and to start to understand the complicated organisation of family violence support services in their region. “By understanding the link between domestic violence and pet abuse, veterinary professionals can be the among the first to see the warning signs; this conference should raise awareness and give them tools to work effectively in this space” Dr Boller said. University of Melbourne School of Health Sciences Senior Research Fellow Kristin Diemer said the conference would raise awareness of how the domestic violence sector and veterinarians can support each other. “At the moment it’s a fragmented system, so individual organisations must find their own links to an animal support service,” Dr Diemer said. The two-day conference will see a variety of talks and panel discussions with a target audience of family violence specialists, academics, and veterinary professionals. The general public is also welcome. A half-day of workshop for veterinarians and veterinary nurses will be held on Sunday, 23 September, delivered by veterinary experts in forensics, imaging, emergency and critical care, and family violence practitioners. Veterinarians will be able to earn continuing professional development points for participation. Domestic violence practitioners will also benefit from a half-day specialised workshops that will focus on examples and knowledge sharing around strategic animal support networks to enable them to connect with care for animals of families seeking to leave dangerous environments and the legal context of pet ownership in domestic violence situations. These will be delivered by experts in veterinary medicine, family law and family violence practice.